Students observed lichen (above) and varieties of moss (below). In October, the 5th grade class went on a field trip to Spring Pond Woods in Lynn. The outing followed a botany block and gave us the chance to enjoy a beautiful autumn forest, identify trees and plants we had learned about, talk further about species of deciduous trees and conifers, and experience a place where boulders mark a site of Wampanoag significance. We spent the whole day in the forest and benefited from the guidance of a parent, Rob Riman, who is an avid naturalist. At the Wampanoag site, the students delighted me with a spontaneous performance of a song Mr. Bota, our chorus teacher, had taught them in lovely harmony. Unfortunately, just as we approached the pond, some ground bees found a few of us, and we returned for the comfort of ice and restrooms. This fractured boulder is of historic significance to the Wampanoag Native American tribe. I wanted a way to reflect on the field trip and deepen the memory of some of the elements that were relevant to our lessons. An artistic approach is my favorite secret weapon for such occasions. A student had recently surprised me with an interest in poetry, so I decided to write the children an alliterative poem that would capture the spooky mood of the month and also give me a chance to check on some language arts skills. How well will they interpret figurative language (something we’ll study explicitly in middle school)? Will they remember basic parts of speech? How will they react to a poem that doesn’t rhyme? Will they recognize a direct experience when presented to them in a new way? 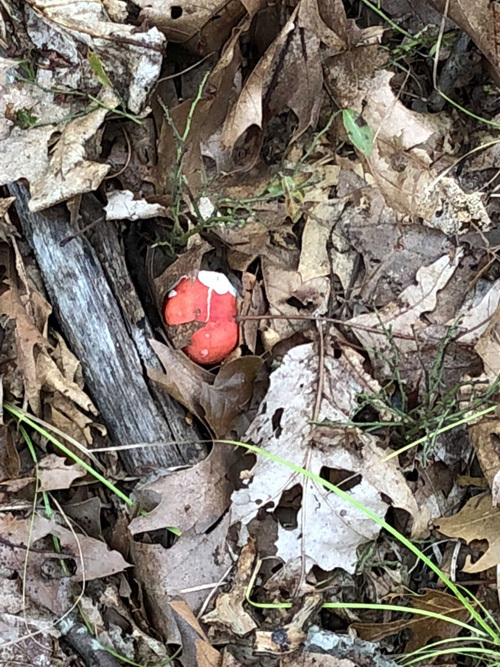 Students were treated to a glimpse of a little red mushroom peeking through the leaves. Think about it as a riddle and give a title that reveals what it is about. Add some nouns in the margin after each line or two that tell what is being described. Below is the poem. Can you tell what is being described? It was clear from their clever titles that the students surely did. They also identified adjectives and verbs that made the poem “juicy.” I liked many of their creative suggestions better than mine! Caw, caw, a ring of ravens balked as we arrived. Pumpkins perched on tree trunks shone a golden glow. Leaflets teamed to make a hickory grow a shaggy skin. Granite giants lay on needle spiked pillows of pine. Decaying leaves blanket their big bodies deep below. Winds spooked the birch leaves who shivered in reply. Girlie ghosts dressed in fern lace try to trip us on the trail. In holes where once were arms. No caws, or glows, or snores, or haunting shivers make us run. We stroll and laugh, tell stories and sing a song. But footsteps found the demons whose evil weapon witched. Sudden stings—those were the zings, the stunts that made us SCREAM! Older PostWhy Waldorf? Why Now?